Standard of New England’s Pipe Chart describes the physical dimensions and weight of standardized pipe. Pipe is manufactured according to these standardized physical characteristics. When looking at our Pipe Chart, choose either the Pipe Size or O.D. size from the two far-left columns as your starting point. Then choose the schedule from the top row. Find where your pipe size and schedule intersect. You will see that each box has two numbers describing your pipe selection. The top number, in blue, is the wall thickness. The black number below is the weight in pounds per foot of pipe. NPS (Nominal Pipe Size), listed in the first column of our Pipe Chart, identifies the nominal diameter of the pipe which lies between the inside and outside diameters. For example, 4″ Sch 80 pipe has an O.D. (outside diameter) of 4.50” and an I.D. (inside diameter) of 3.826″. A pipe’s schedule identifies its wall thickness and is trickier than you think to get right. 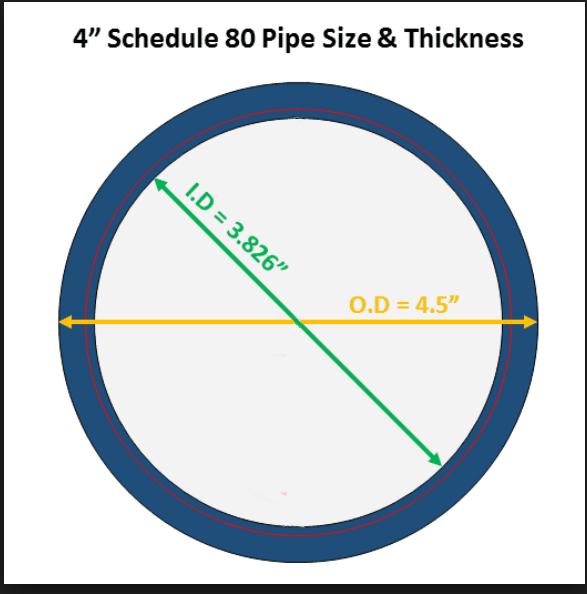 For example, the schedules for 40 and STD pipe from 1/8” through 10″ are identical. Above 10”, however, the schedules of 40 or STD pipe vary and must be specified to clarify the required wall thickness. The same is true for schedules 80 and XH which must be clarified above 8”. The weights given on our pipe chart are based on carbon steel pipe but can vary due to many factors including manufacturing tolerances and other allowable factors such as alloy. For most situations this weight is an acceptable estimate for estimating freight costs. Click Here to download our Pipe Chart.